Here’s an easy vegan salad with well-known ingredients that require minimum cooking skills. 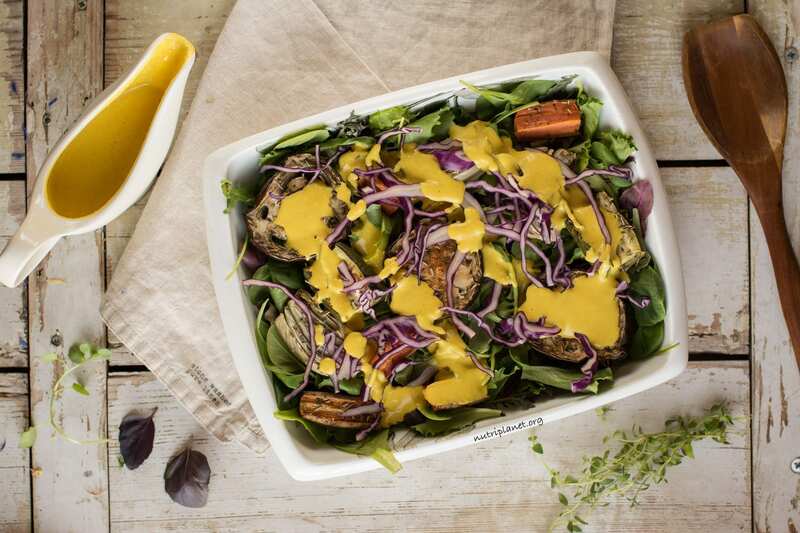 Roasted veggies are deliciously juicy and flavourful while Tahini-Chickpea Dressing adds this perfect richness to your lunch or dinner bowl. Scroll down for how-to video! 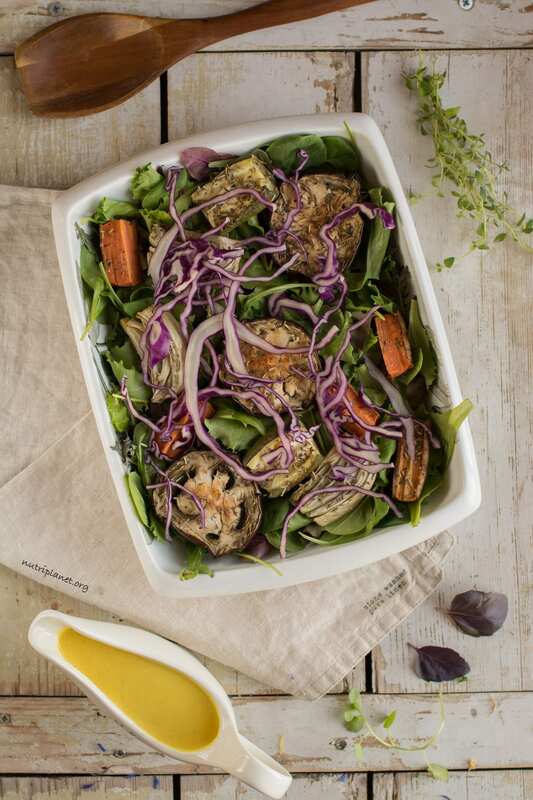 Furthermore, this vegan salad recipe is quite quick to make, even from scratch. You start by tossing the veggies into oven and while they are roasting you whip up the dressing and raw salad base in no time. When you finally hear the timer peeping you’re basically ready to serve and eat. This is your canvas to start with! What’s noteworthy is that you can make the process even quicker by baking a bigger batch of veggies and storing them airtight in fridge. Needless to say, the latter goes for the dressing as well. Considering you’ve done all that, it’d take about 5 minutes to prepare nutritious vegan salad bowl after a long day at work. 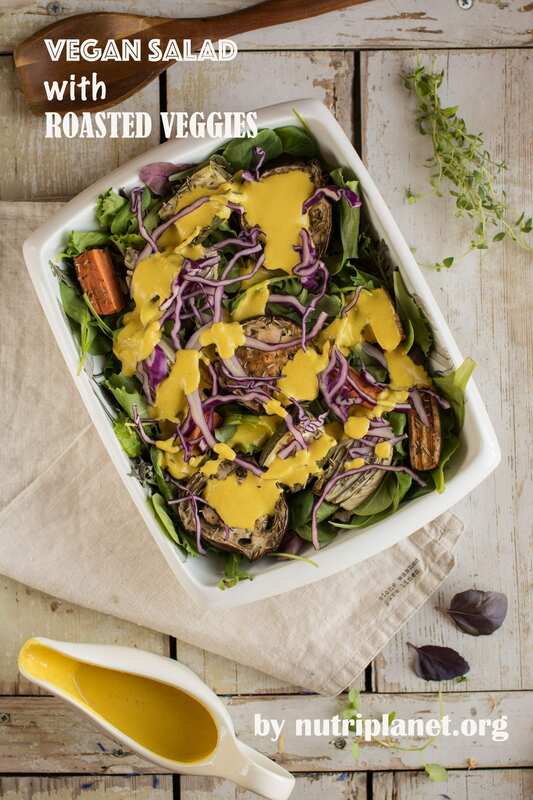 By all means, you’re welcome to play the veggies around and experiment with different vegan salad dressing recipes. They say that, salad and dressing go hand-in-hand. Why not trying also White Bean Dressing, Veggie Sauce, Chanterelle Gravy, Spicy Tomato Sauce! While I love thick warming soups in winter, I find myself eating salads throughout spring and summer. Fortunately there are so many vegan recipes for salads. For example, you could be making simple quinoa salad, black bean salad, potato salad, tomato salad or Caesar salad with lime dressing. I always prefer an oil free recipe as far as dressings are concerned. Yep, not even olive oil! All extracted oils are better consumed as part of the fruit or plant it was extracted from, e.g. olives, avocado, coconut and other nuts and seeds. This way you’d also be getting the fibre, vitamins and minerals, i.e. the whole package. Feel free to leave a comment if you try this recipe and tag me in social media should you share a photo of your creation. Enjoy! First, cut your eggplants and summer squash into thicker slices. Slice the carrot and fennel as well and place them on a baking sheet lined with parchment paper. Sprinkle some Himalayan salt onto eggplants and let sit for 15-30 minutes until you see water drops on their surface. Next, sprinkle all veggies with some dried rosemary, thyme, oregano and black pepper and bake at 200°C (390°F) for 35-40 minutes until you see that the eggplants are well wilted. While the veggies are roasting, prepare Chickpea-Tahini Dressing. 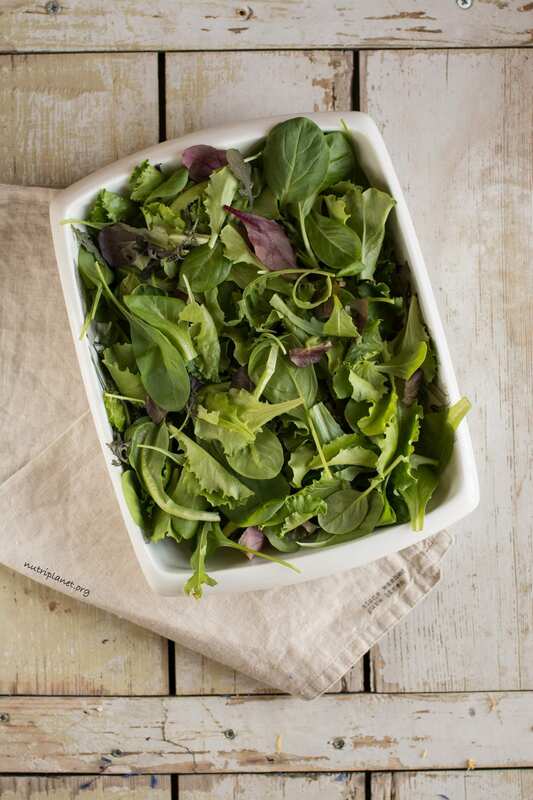 Combine your salads by placing lettuce and raw cabbage into the bowl and topping it with roasted veggies. Finally, top the salad with dressing. 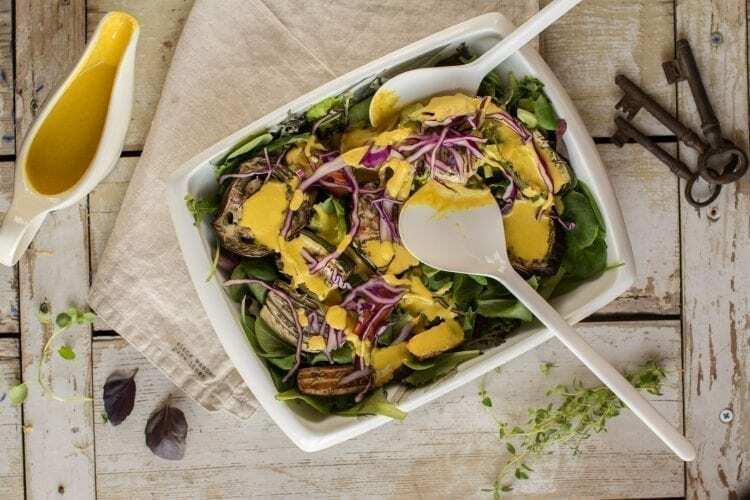 Nutritional info per serving (includes 1 serving of Tahini Dressing): 255 kcal, 36.7g carbohydrates (46.1% of kcal), 8.92g fats (31.5% of kcal), 14.3g protein (22.4% of kcal), 14.9g fibre, 10.9 GL points. It’s not mandatory to sprinkle the veggies with herbs before baking, but it does give them a nice note. Red cabbage can be substituted with white cabbage or even sauerkraut or kimchi. Go wild and add some fresh herbs like basil for example. Finally, alfalfa sprouts would also be an excellent addition to this vegan salad.